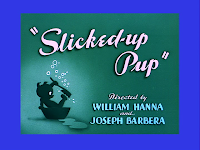 "Slicked-Up Pup" is one of many cartoons that involves Jerry trying to frame Tom in order to get him in trouble. This time the trouble comes in the form of Spike the bulldog. After inadvertantly knocking Spike's newly-bathed son into the mud, Spike warns Tom that if his son does not remain clean, there will be a thrashing administered. 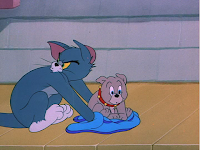 Jerry, of course, does everything he can to get the puppy dirty and make it look as if Tom was the culprit. 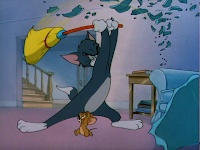 Tom repeatedly has to clean the puppy from Jerry's constant sabotage. Jerry tricks Tom easily into a game of tic-tac-toe...using the puppy's body as the game board, and forces Tom to take a mud-dipping and a tomato to the face in order to shield the puppy from any potential grime. 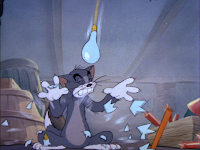 Tom thrwarts Jerry's ink-dousing attempt, only to accidentally dump the ink on the puppy himself. 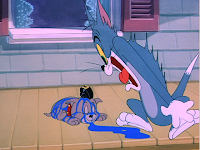 As Tom tries to paint the puppy his natural color, Jerry switches the paint buckets causing the cat to turn Spike's son into a technicolor nightmare. The water hose is switched to dispense tar and Tom is forced to pass the puppy off as a chicken. Spike wises up and saves his son from the washing machine, only to throw the defeated feline into the machine instead. 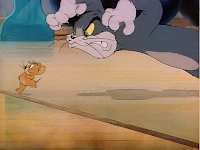 I will never get tired of Tom's wild "takes", accompanied by his shrieks of terror, that are littered throughout the Tom and Jerry series. 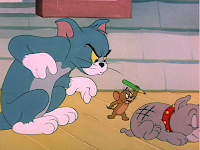 The best Tom and Jerry cartoons are the ones that really stay away from any kind of story and just feature the cat and mouse beating the tar out of each other. 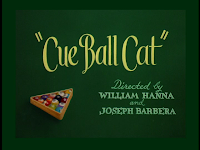 Such is the case with "Cueball Cat". 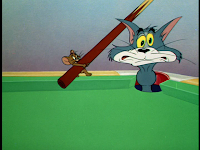 Tom is playing pool in an empty billiards hall and Jerry has the misfortune of living within the pool table. The gloves come off quickly. 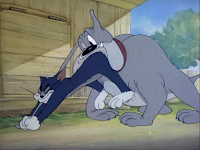 Both Tom and Jerry take thier knocks in this one, an equally painful competetion which is always nice to see. 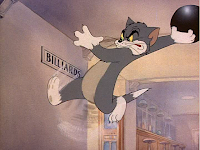 Jerry is crushed and run down by numerous billiard balls, while Tom swallows more than his share of them. 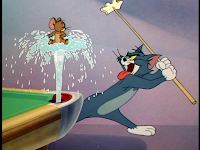 Jerry has a cringe-worthy encounter with a pool cue tossed javellin-style by Tom, and the mouse returns the favor by giving Tom a licking with an extremely flexible pool stick. 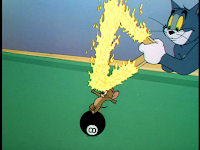 Tom gets 86'd (literally) and Jerry gets a good impression from the 8 ball. Fire hoses, hand injuries and a well-placed needle make for moral-free cartoon fun. Happy Thanksgiving, everyone. I know that I have been very neglectful of this blog, but life is just very busy these days. I will do my best to post updates here at least once a week. So, on with the show. 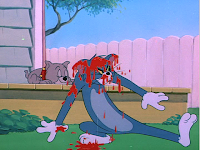 In "Heavenly Puss", Tom's dangerous dealings with Jerry finally result in his own demise. A piano crushes Tom and sends him into the afterlife. Tom rides a golden escalator into the sky and tries to sneak onto the train to heaven. 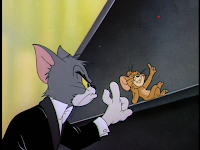 However, the conductor knows all about Tom's evil ways on earth and will not allow the cat admission, unless he can obtain Jerry's signature on a document which absolves Tom of all wrongs inflicted on the mouse. 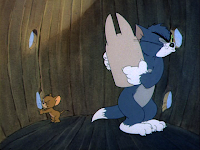 Faced with the alternative (an express ticket to hell), Tom returns to earth and tries to sweeten Jerry up in order to obtain his signature. 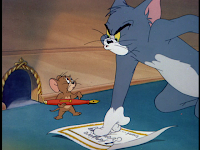 Jerry's not falling for Tom's nice-guy-routine, and the cat attempts some forgery. He quickly learns that those in charge of heaven see all. 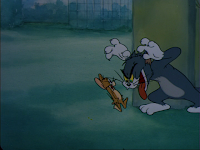 In a great pantomine scene, Tom begs and pleads with Jerry in desperation. He finally obtains Jerry's signature but it is too late. 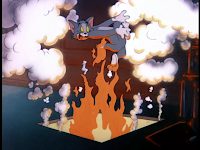 Tom is hurled straight down to the waiting cauldron of the devil, Spike. 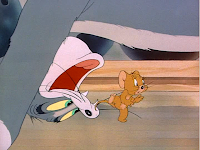 Of course, it's all a dream and Tom awakens with a newfound affection for a confused Jerry. 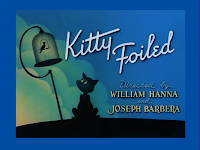 I had another tough choice to make between "Kitty Foiled" and "Old Rockin' Chair Tom". I opted for the former simply because it is what Tom and Jerry are all about. This cartoon has no plot whatsoever but one is not needed. Cat chases mouse and bird. Plenty of cringe-worthy pain is inflicted upon cat. This one is filled with slam/bang action from start to finish. 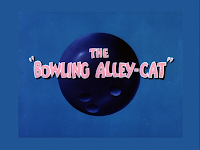 The only brief pauses in the action are when Jerry and the canary don indian disguises to allude Tom and when the canary holds Tom at gunpoint. Tom runs fast enough to gain some air, but only briefly, and finds his muzzle in the shape of a mouse hole more than once. 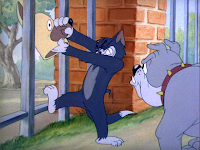 A birdcage and floorboards are used as weapons against the cat, and Tom gets all of his teeth knocked out by Jerry weilding a hammer. One amusing moment is when the canary has a gun pointed at Tom. 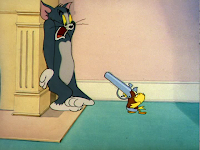 The bird drops the gun, and Tom politely (but nervously) picks the weapon up and hands it back to the bird so that the threat can resume. 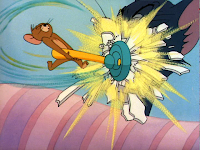 Tom's attempt to run Jerry over with a model train is foiled by the bird, who drops a bowling ball onto the tracks, sending Tom crashing through the floor. Not much more to say here really. Everything you could want in a T&J film. Though I do still really like "Old Rockin' Chair Tom" too. Oh well. The perils of only highlighting one cartoon per year. 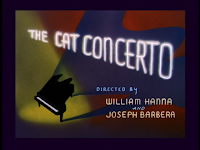 It's a shame that there is some controversy surrounding "Cat Concerto" (You know, that whole "Rhapsody Rabbit" thing) because it can overshadow what is one of my favorite Tom and Jerry cartoons. Tom takes to the stage to perform "Hungarian Rhapsody #2". Let me say right now how much this piece of music sticks with me. It has been used in so many cartoons over the years, but never as perfectly as it is used here. 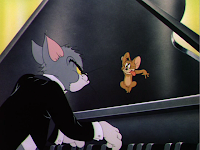 Of course, Jerry is living inside of Tom's piano and his sleep is disturbed. Jerry is not antagonistic at first. He actually tries to enjoy the music until Tom flicks him away. 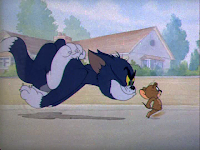 The battle is now on as Jerry tries to ruin Tom's concert. 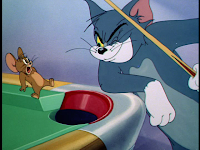 He slams the keyboard cover down on Tom's hands and uses a cleverly placed mousetrap. 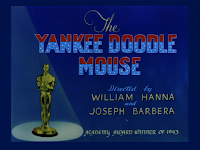 The mouse raises Tom's bench to ridiculous heights and interrupts the music by playing some jazz riffs on the piano hammers. 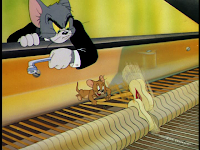 Tom gets his moments as well as he punishes Jerry inside the piano during the song's frantic climax. 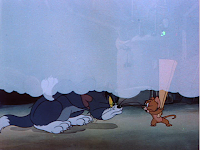 Finally however, Tom can not keep up with Jerry and wears himself out, allowing the mouse to receive the applause. 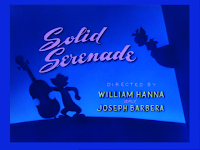 "Solid Serenade" is another Tom and Jerry cartoon that always sticks out in my mind, if for no other reason than Tom's rendition of "Is you is or is you aint my baby". Tom sneaks over the wall with his bass fiddle to serenade his girl, but first he must deal with Killer the bulldog. A bit of taunting and some rope does the trick. 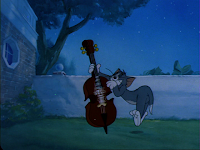 Tom's bass gives off enough vibrations to send Jerry bouncing helplessly around his home and the mouse is quick to break up the concert. What better way than flinging a pie laced with an iron at the cat? I can't think of one. 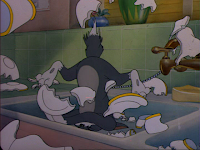 The chase is on as Tom ends up springboarding into a pile of dishes and Jerry slams a window on Tom's neck. 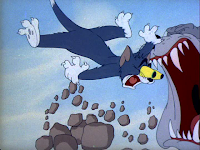 Jerry unties Killer but Tom subdues the dog with some trickery as well as a brick to the head. 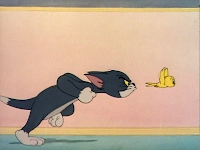 Tom pauses during the chase to swoon over the female cat, but at one point, Killer inadvertantly becomes the object of Tom's desires. "You set my soul on fire. It is not just a little spark but a flame." 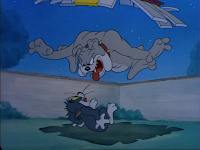 Tom chases Jerry into the doghouse, where Killer awaits. 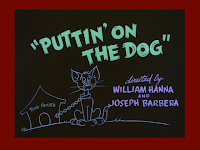 The dog pummels Tom and ties him to the bass fiddle for a musical number of his own. 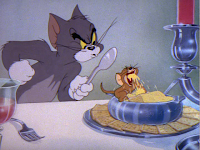 Anytime you see a beautifully arranged dinner table in a Tom and Jerry cartoon, you just know that a food fight isn't far away in the future. Mammy is expecting dinner guests, but Tom has plans of his own. 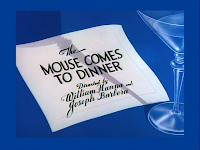 He invites his girl over for dinner and forces Jerry to be thier personal servant. 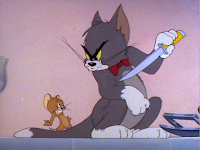 Tom and Jerry go back and forth trying to humiliate each other. 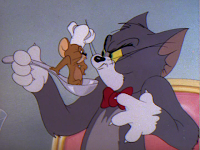 Jerry spits hot soup in Tom's face and the cat retaliates by holding Jerry over a candle on a spoon. 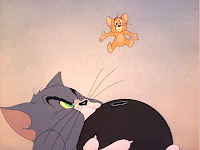 When Jerry mocks Tom's failed attempts at kissing his girlfriend, Tom retaliates by using the mouse as a living corkscrew. Soon a food fight erupts, with many a pie in the face. 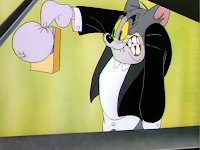 Tom even gets a salt-shaker-laced cremepuff down his throat. However, what fun is throwing food when all of those sharp knives are just laying around? 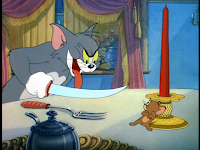 Well, Tom and Jerry put the knives to good use, making the battle much more dangerous, and funny. 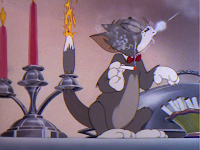 Tom, once again, seems to have no feeling in his tail when Jerry plants it in a sandwich, a dessert and a candle holder, but Tom regains feeling in his tail when he repeatedly bites it and when it is set on fire as he tries to enjoy a smoke. 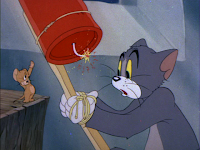 At last, Tom is completely knocked cold and Jerry sends him sinking in the punchbowl.